Nigeria's national women's basketball team, D'Tigress, is off the team list without a win at the FIBA ​​Women's World Cup. D'Tigress after losing her first group game against Australia on Saturday she had a 74-68 victory over Turkey on Sunday to register her first victory in the women's basketball flagship championship. Sarah Ogoke was Nigeria's heroine in Sunday's victory; falling a team of high 22 points in the contest. While Ogoke is happy to see Nigeria beat Turkey, she has promised that it is only the beginning of more to come. "It's not over yet and we're just getting started," he told Fiba.com. "I'm not satisfied at all because it's a great victory for me, but we can not feel comfortable until we beat Argentina and move into the next round. "I've been playing for the national team for a while now and I felt I had a point to prove and Nigeria also had a point to prove, we are not the typical African basketball country." "We have a lot of talent in this team and we have a lot of experience and finally we had the opportunity to show it." 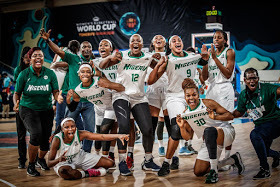 Meanwhile, D'Tigress head coach Otis Hughley has also expressed great satisfaction with the performance of his girls, even when he admitted that Turkey was not easy.